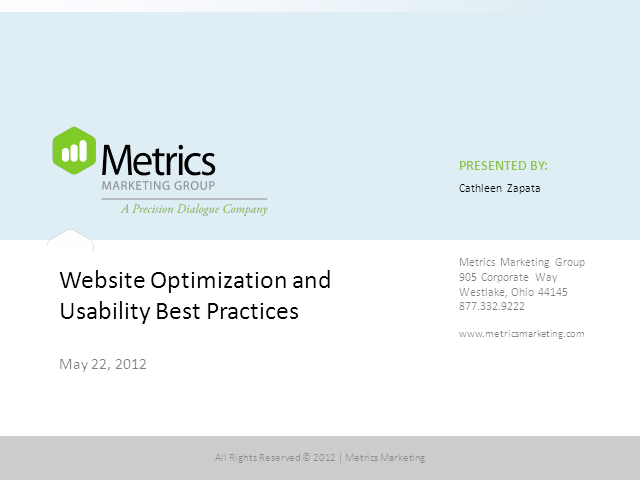 This presentation will cover why website optimization matters in the first place, along with key points of measurement, web optimization strategy techniques, and usability best practices to utilize to improve conversion and the overall user experience. Cathleen Zapata is currently VP, Research & Customer Experience at Metrics Marketing Group, an analytics-driven database and interactive marketing firm in Cleveland, Ohio. She is also the President of the Northeast Ohio chapter of the Usability Professionals' Association, one of the most trusted organizations in the field of usability with over 2500 members worldwide. Cathy has over 17 years experience in quantitative and qualitative research, specializing in website usability. Her background includes a wealth of experience in traditional market research, usability testing, usability heuristics, user research, eye tracking and conversion enhancement strategies. Cathy has been featured and published in MarketingSherpa, About.com, UX Magazine, BAI Retail Delivery, Crain's, Quirk’s Marketing Research Review, has contributed to the Usability Book of Knowledge, and regularly teaches on topics of web usability and conversion strategies internationally. Cathy has worked with a variety of clients to optimize their customer experiences, including American Greetings, Sterling Jewelers, Four Seasons, KeyBank, First Midwest Bank, Nationwide Insurance, OfficeMax and more.